I thought I loved my faux leather moto jacket until I picked up it's sister - the suede version. Aaah! I didn't think I could love it more but I do. I think the difference is this one is real suede whereas the other one I have is faux leather. The different fabric could change the shape and way it forms to the body, but the suede one is double the price of the faux so I would assume the quality to be slightly better. 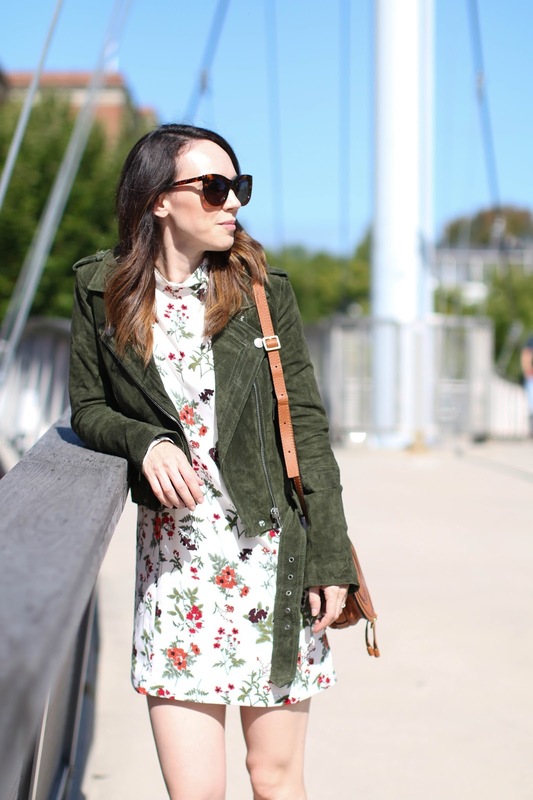 I'm continuing my moto jacket styling series and I love that this dress has a more delicate quality to it which contrasts the jacket. I didn't show the full dress but it actually has long sleeves and a mock turtleneck so it is great for the transitional weather, though I can see it working well into the spring season too. I enjoy pairing an edgier jacket with a softer or more feminine item to balance out an outfit. 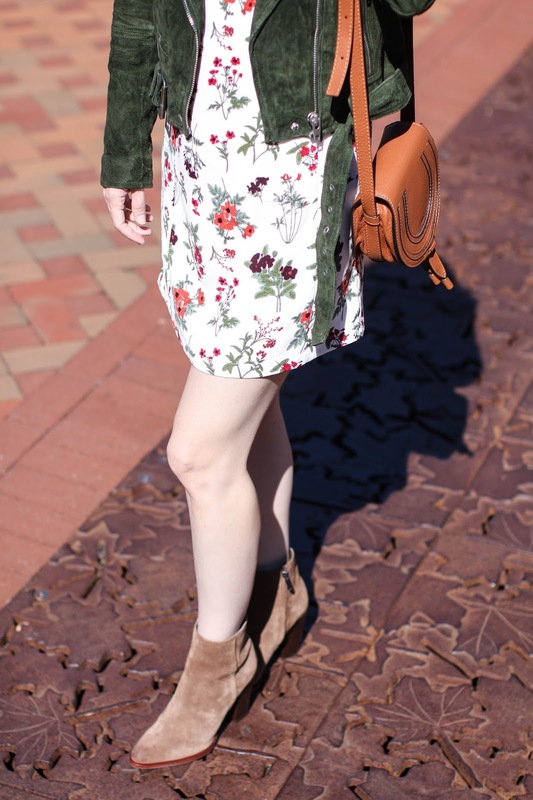 I also styled this suede jacket with another super girly item that I will be showing on the blog next week so be sure to check back. I love fall but it's beginning to move into the part of the season where I need to bring 15 layers with me and then take them off midday because it warms up quite a bit by 4pm. However, I am still enjoying the fact that the humidity is nearly gone and my hair can finally live its best life. Speaking of hair, my curling iron (that I just showed in my tutorial video) broke and I am on a mission to find a new one. I ordered this one and unfortunately am sending it back because the curls it gave me were way too tight. I did some more research and settled on this set, and am hoping it is as good as everyone says. Love the colour of your jacket. 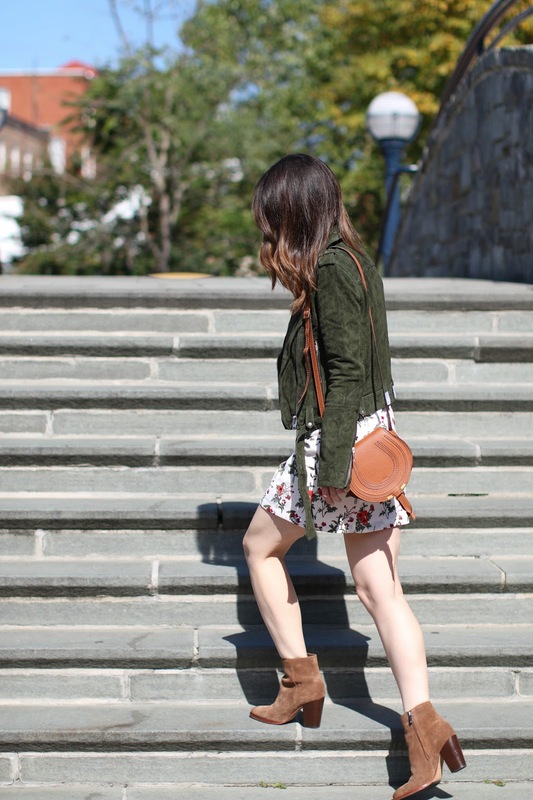 It is great Autumn fashion staple... Great post! Obsessed with the color of that jacket!